Dive into 31 knitting patterns inspired by Jane Austen and the Regency era in which she lived, discover the history of dorset buttons, and more in the Jane Austen Knits 2013 special issue. From the editors of Spin-Off magazine comes another edition of the popular special issue Jane Austen Knits! Drawing on a love for literature and the Regency era, this magazine is full of knitwear inspired by the novels of Jane Austen and the Regency era within which she lived. Knitwear designers have created 31 beautiful and functional garments that are wearable today by women, men, and children. The knitting patterns in this inspired special issue magazine will challenge the advanced knitter, engage the intermediate knitter, and invite the beginning knitter. Fans of Jane Austen will also enjoy an interview with Hunter Hammersen, a look at pincushions and thread-cases from Persuasion, historical information on dorset buttons, and more. Whether you are an avid knitter, a Janeite, a lover of the Regency era, or all of the above, you will find something to fit your fancy in this magazine. Order your copy of Jane Austen Knits (or download it today!) and be inspired! COUNTRY: Visit the countryside of a Jane Austen novel full of feminine lace details and sturdy menswear. These knits are practical, with added details that true craftsman can appreciate. GARDEN: Spend some time in a beautiful garden with these Jane Austen inspired looks. Wrap up in shawls, cardigan, and spencers with unique closers and flattering necklines. MANOR: These sensible knits include mittens, a night cap, gloves, a tea cozy, and socks; all for days and nights spend inside a the comfort of a manor. TOWN: Ladies of the Regency era would never appear in town without their finest wear. These knits have ornamentation aplenty, with ruffles, ribbons, and knitted lace. 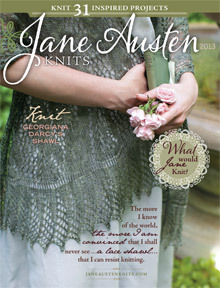 Grab your copy today of Jane Austen Knits 2013!